Detective Constable Aidan Waits isn’t exactly the golden boy of Greater Manchester Police, and to a certain extent, he seems to accept that. Consigned to night shift, stuck in a loop of answering emergency calls he never gets the chance to see through to resolution, he’s drifting, personally, and professionally. So when he and his partner (DI Peter Sutcliffe) are called to a disused hotel, the monotony is broken by the discovery of a body. A man whose identity seems to have been erased, right down to his teeth having been replaced, and the tags sliced out from his clothes. Most disturbing of all, the man appears to be smiling - even in death. 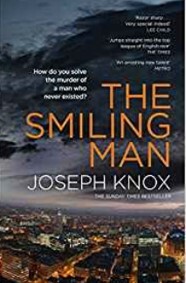 Waits starts to piece together strands of the mystery man’s life, a seemingly impossible task, and when some of his own ghosts look like they’re coming home to roost, he’s not sure he can trust anyone, including his own colleagues, to uncover the mystery of the smiling man (as well as coming to terms with the darker parts of his past). It barely feels like yesterday since I read Sirens, one of the standout debuts from last year, so I came to the sequel with a level of anticipation. I am happy to report that it more than lived up to Joseph Knox’s debut. As a backdrop, Knox’s Manchester is as gritty and raw a setting as you’ll come across. While Waits is an interesting twist on the classically flawed policeman; most of his colleagues see him as damaged goods, some believing he’s as corrupt as those he’s up against. As readers, we see this perception clash with moments of moral clarity and strength, almost like he deliberately fosters the tarnished image, to create the space to do things his own way. His quest to learn the identity of the Smiling Man turns borders on a voyage of self-discovery, and being along with him for the journey, seeing behind the face that he presents to his boss, and his partner, you can’t help but root for him every step of the way. This has the potential to be one of the classic police procedural series in coming years, and a dead certainty on be my To-Be-Read [TBR] pile.